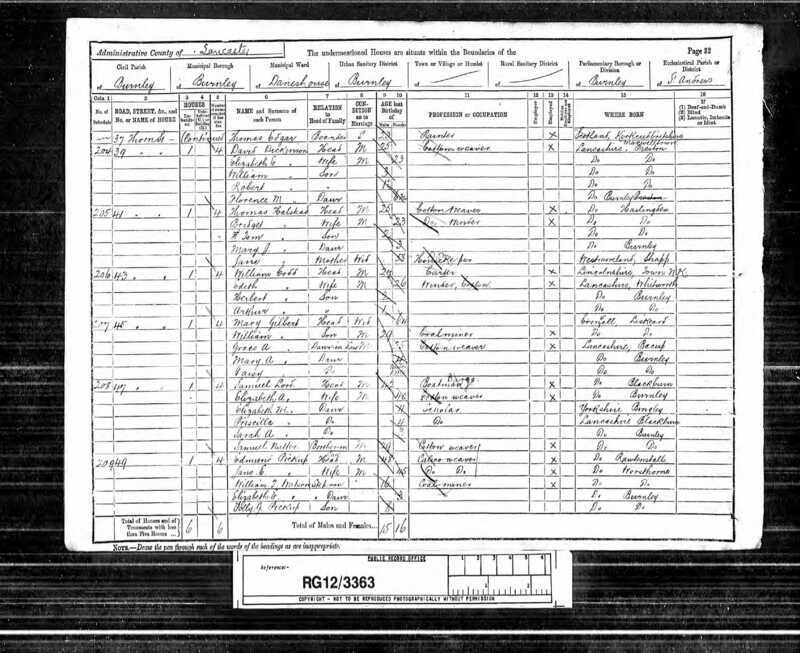 Thomas and Bridget Halstead were parents to six children, all born between 1888 and 1899 as the family moved around different towns across east Lancashire and the West Riding of Yorkshire. 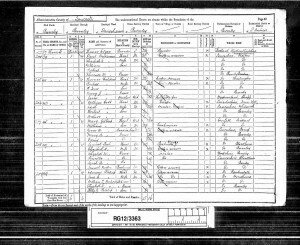 Bridget was an Irish immigrant from Dublin and Thomas, born in Haslingden, to where his family had moved some years earlier from a remote part of Cumberland, was, by trade, a spinner in the cotton industry. 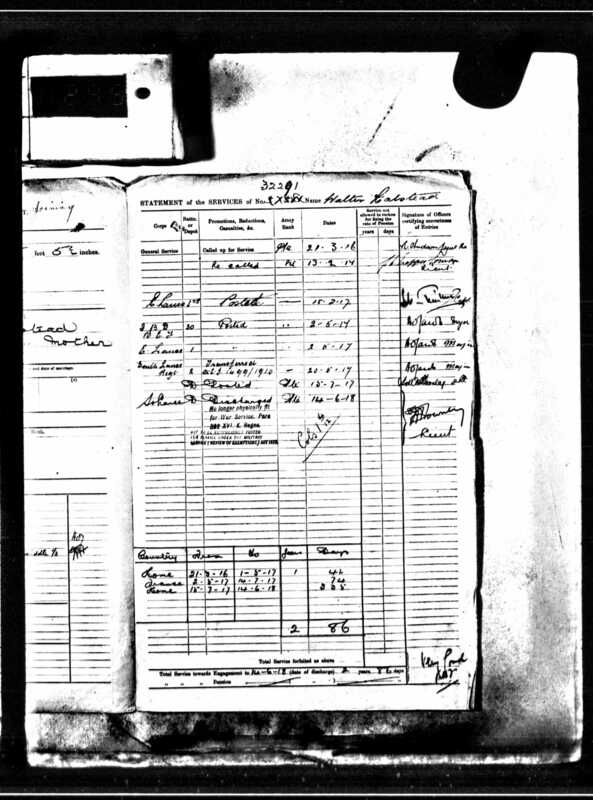 It is quite possible that the family moved around to where work was to be found. 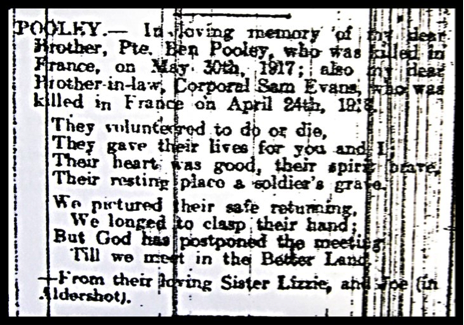 Mary was their oldest child and only daughter and the ages of the five sons – Tom, Richard, Robinson, Walter and Frank, meant that they were all eligible to volunteer for military service either at the start of, or during, the First World War. This they all did, with tragic consequences for the family. At some point before the census of 1911 Bridget and her five sons moved to Bank Row in Goodshawfold, within the parish of St James the Less church, which they attended regularly after moving there from St Mary’s parish, Haslingden. 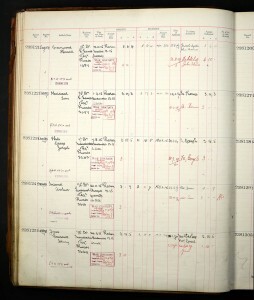 Bridget is recorded in the census as being the head of the household. 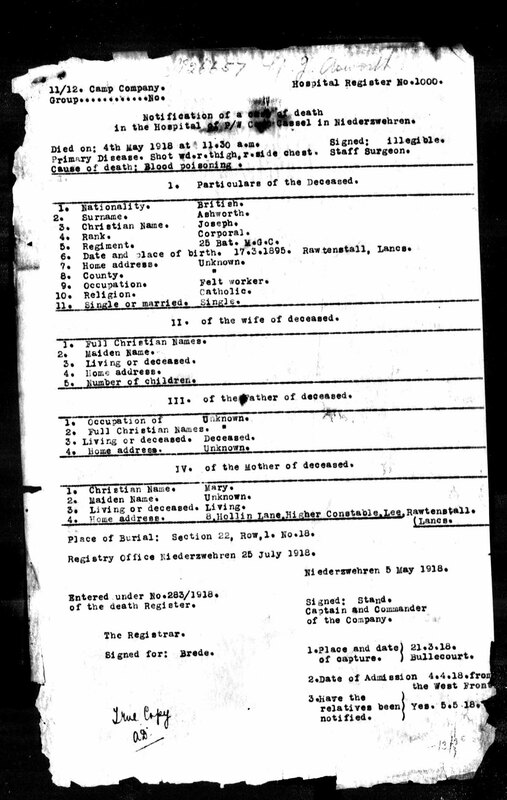 The oldest child, Mary, would appear to have left home and, from further research into the family, it is quite possible that Thomas was at that time a patient in what was then the Pike Law Workhouse (the recently demolished Rossendale General Hospital building). 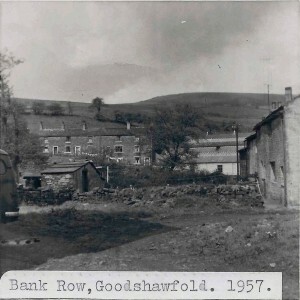 Bank Row, like most houses for the working population at the time, was linked to employment in a nearby mill, in this case the Calico Print Works in Loveclough and this was where Tom, Richard, Robinson and Walter worked (Frank was still at school) and, like many of their fellow workers at the print works, enlisted with the army.  Tom Halstead – Tom joined the East Lancashire Regiment in 1915 and after training was deployed with his battalion to Gallipoli in Turkey as reinforcements for troops who had been under siege on the Dardenelles peninsula since May. 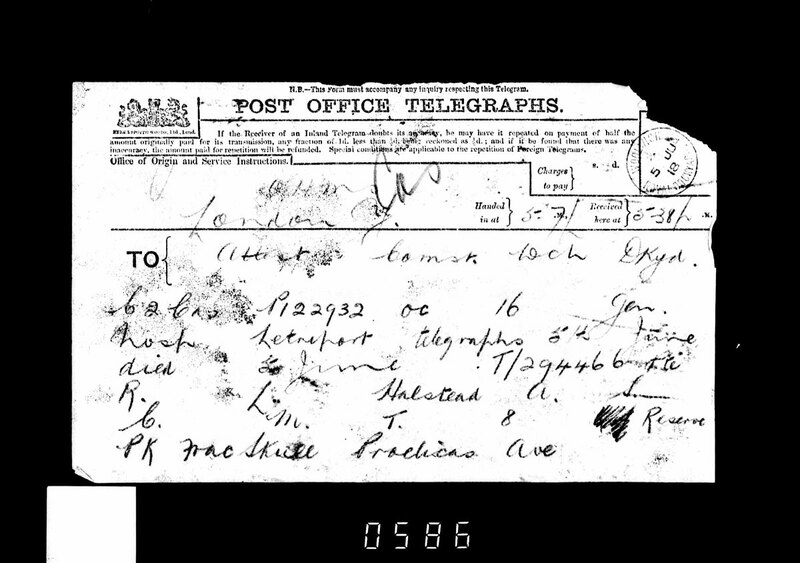 Within weeks of landing there Tom was killed and subsequently buried in the Twelve Tree Copse Cemetery at Helles, along with almost 2,500 other soldiers. 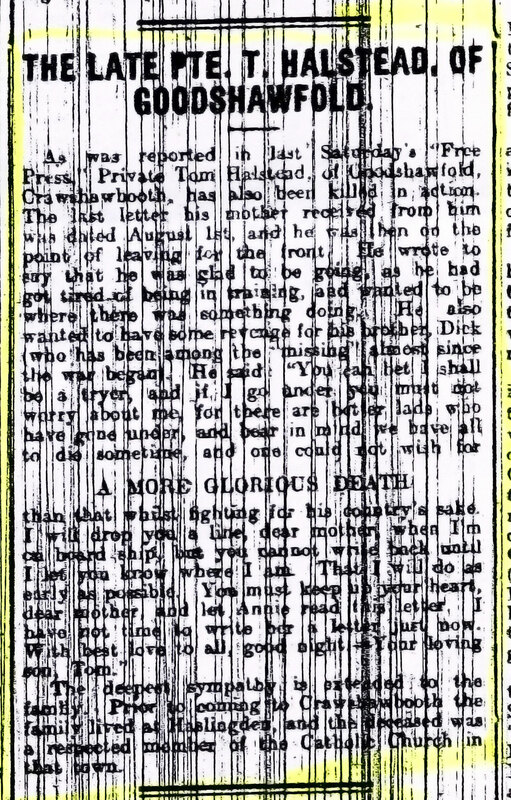 Shortly before his departure for Gallipoli Tom wrote a letter to his mother, some of which was transcribed and published in the Rossendale Free Press newspaper on 2nd October. 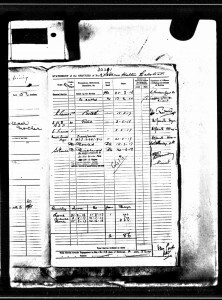 Tom’s remaining effects – pay owing and war gratuity – were collected by his father, Thomas, on separate occasions in 1916 and 1919. 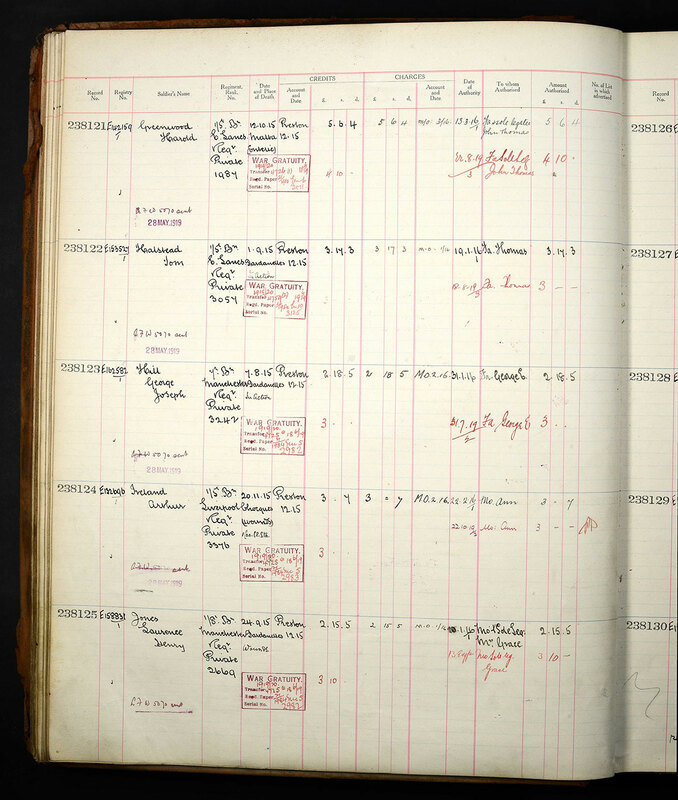 Richard Halstead – It would seem clear that Richard was either a regular or reserve soldier in the East Lancs Regiment before war was declared on 4th August 1914 as his battalion (1st East Lancs) was mobilised at Colchester on 5th, trained together then sailed for France on 18th. They were to reinforce the British Expeditionary Force already there but, in the early hours of 24th, having taken up their position at Beauvois, were attacked by heavily armed German forces. 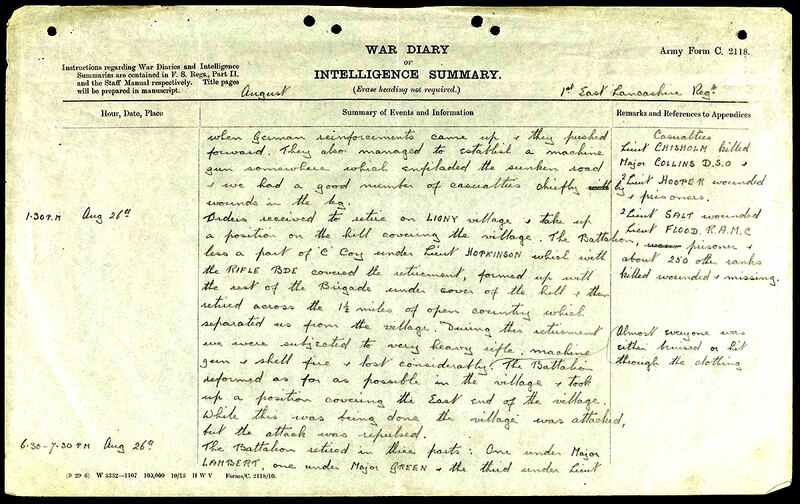 Over 250 men were killed in a matter of a few hours, including Richard, This was to become known as the Battle of Le Cateau, one of the very first in the war. Richard’s body was never recovered and he remained ‘missing in action’ until his death was confirmed to his mother Bridget, a year later. He is commemorated at the La-Ferte-Sous-Jouarre Memorial to the Missing in France, along with 3,740 other soldiers of the British Expeditionary Force. 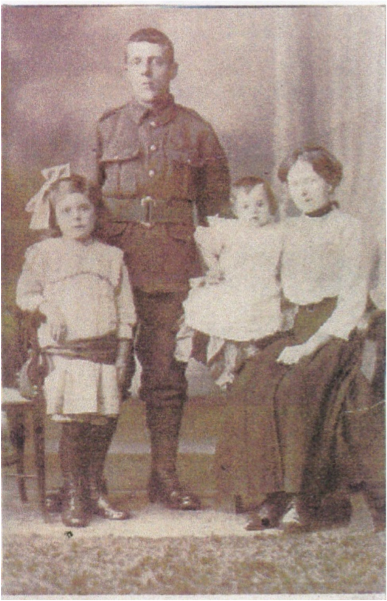 Robinson Lancaster Halstead – Robinson enlisted into the Liverpool Regiment at Rawtenstall in May 1916, by when he was married with an eight month old son and was living at Barley Holme, Crawshawbooth. 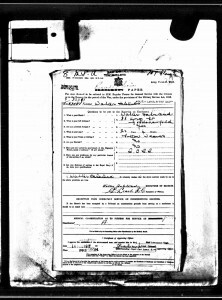 In January 1917 Robinson was transferred to the Army Service Corps Mechanical Transport Division and, as a driver, was posted to France in October. On 4th June 1918 Robinson was attached to the 35th American Division and transporting weapons for front line troops when his vehicle crashed. 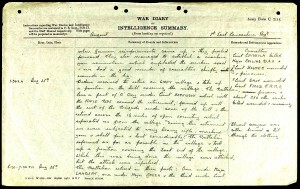 Robinson suffered fatal injuries and died the following day in Le Treport military hospital. 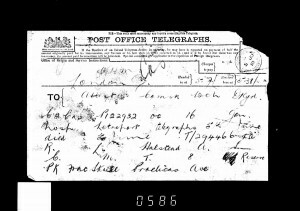 News of Robinson’s death was communicated back to his military base in Woolwich by telegram and from there to his wife and family in Crawshawbooth. 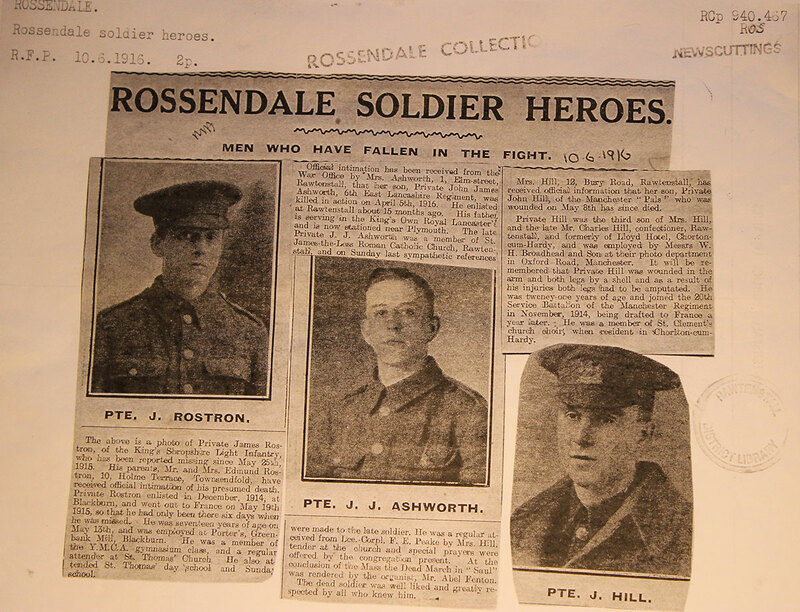 The Rossendale Free Press published two articles on Robinson and Bridget’s loss of three sons. Robinson was buried in Mont Huon Military Cemetery in Le Treport, where he lies with over 2,000 soldiers from the eight military hospitals which were established in the area over the course of the war. 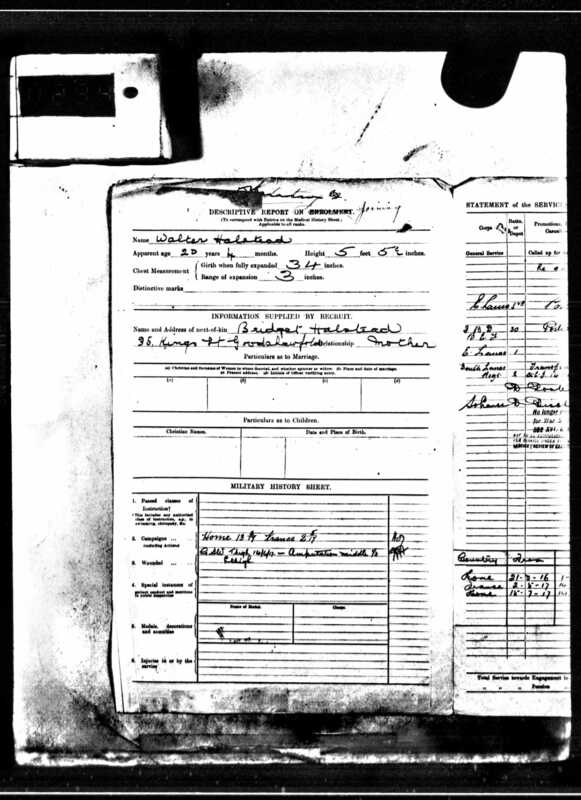 Walter Halstead – Walter survived the war but at significant cost, suffering a serious leg injury in the battle of Messines, Flanders, on 14th June 1917, when his battalion of the South Lancashire Regiment led an advance to take the Ferme de la Croix. The injury resulted in him having a leg amputated. 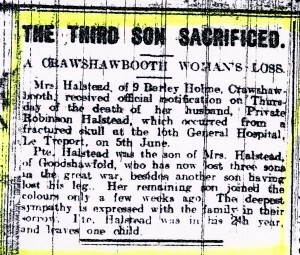 A month later Walter returned to his mother’s home, which was then 35, King’s Street, Goodshawfold. 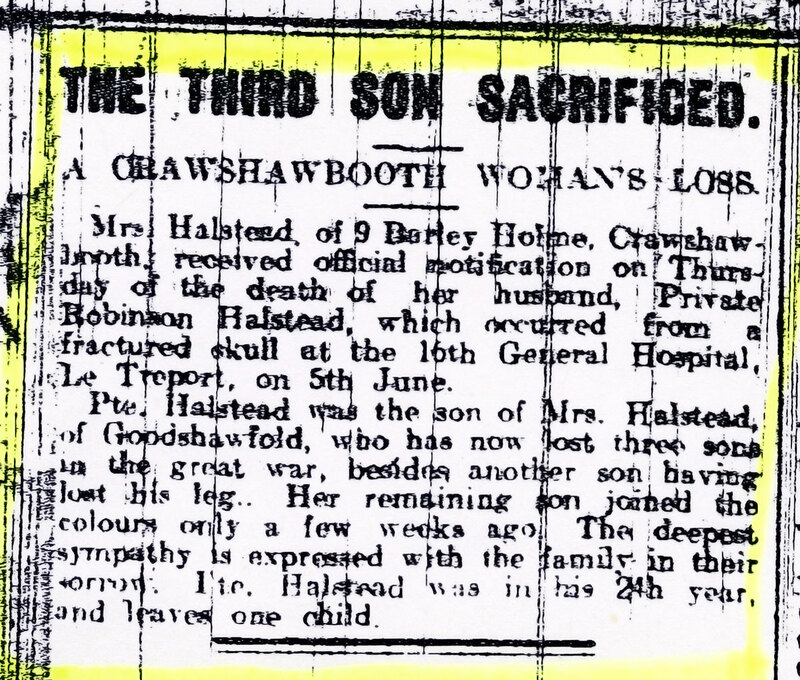 So, by June 1918, Thomas and Bridget Halstead had lost three sons with their fourth seriously injured and disabled. This left only the youngest, Frank, alive and uninjured. What happened to Frank? 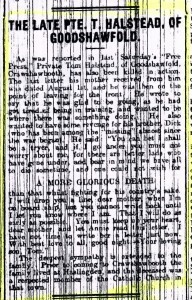 Well, as yet our research has failed to identify anything about him other than the Rossendale Free Press report of 8th June 1918 that he had recently enlisted. Hopefully, Frank survived what were to be the last few months of war.